Acer Palmatum 'Kandy Kitchen' is a slow growing shrub and tree that can be grown in USDA Plant Hardiness Zones 5B through 9B. It matures to an average height of 5 feet to 6 feet and an average width of 4 feet to 6 feet, depending on climate and other environmental factors. It prefers growing in a location that provides full sun, morning sun with afternoon shade, morning shade with afternoon sun or filtered sun and grows best when planted in loam soil that is well drained. The foliage is red and pink in color. It attracts visual attention and is resistant to deer and heat. Kandy Kitchen Japanese Maple can be useful in the landscape along woodland borders, in foundation plantings, in containers or planters, as an accent, as a focal point, in landscape beds or islands, to add property value, to accentuate entryways or as a tree form shrub and also in theme gardens or shade gardens. Originating as a witches broom, Kandy Kitchen grows into a dwarf shrub or small tree to about 5 to 6 feet in both height and width. 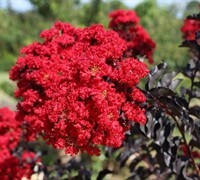 The foliage emerges a pinkish-red in spring, changes to purple-red in summer and then to scarlet in the fall. Pink new foliage throughout the season contrasta beautifully with the darker mature folige. A perfect selection for smaller garden spaces and containers.